We've got one month until the Olive Juice Music Distro/Store section closes for good. Don't worry everything else on the OJ music site and forum will stay, but as of March 1st there will no longer be a Distribution section at Olive Juice Music. 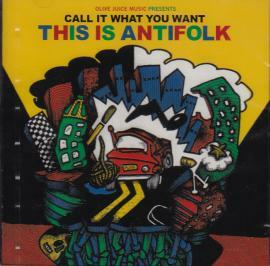 To help commemorate its passing we are offering a discounted version of the Call It What You Want: This Is Antifolk CD. For just $5.00 you can pick up one of these limited edition CD's that includes a lot of the key players of the early 2000's NYC Antifolk Scene including: Hyperjinx Tircycle featuring Daniel Johnston, Jeff Lewis, Kimya Dawson, Adam Green, Paleface, Seth ov Dufus, Schwervon!, Prewar Yardsale and more! All songs were recorded at Olive Juice Music studios in NYC by Major Matt. Vibrant cover art by Toby Goodhsank. Each order comes with a set of 3 badges from the 3 OJ All Day Festivals. Stay tuned for more discounted items in the coming weeks and thank you all for supporting real independent music. Where do CDRs go when they die? Submitted by Vincent Nifigance on Wed, 02/01/2012 - 12:27pm. I won't miss my CDRs, and I certainly don't want to see any money (if any is even sitting around) I'd rather that went to making sure the rest of OJM lives on. But I'd like to know my albums weren't going to a landfill. Submitted by MMM on Wed, 02/01/2012 - 1:03pm. Did you get the email from me? I'm suggesting that people first discount their stuff for the month and promote accordingly. Secondly, I could make arrangements to either hold onto them and get them back to you in some way or maybe offer them for free takers. If you wanna hit me up with an email and we could discuss it further if you like. info at olivejuicemusic dot com. Thanks Seth!